When I was in the throes of labor, I wasn’t exactly thrilled to see Zach capturing it on camera. But now that it’s all said and done, I have to admit that it’s pretty cool to have Parker’s “birth day” documented from start to finish. Watching this video brings back all the excitement of those first hours and days of his life, and it will be so cool to show it to him one day. This has been a good week so far! The weather has been gorgeous, so we’ve been taking lots of walks around the neighborhood and in Washington Park. I also got back on my bike for the first time in 10 months, and I can’t even begin to describe how great that felt. My dad and I rode almost 12 miles, which is nothing compared to the 20-25 we usually did before I got pregnant, but I’m easing back in. Oh yes, and then there’s Parker :) He’s up to 9 lb, 5 oz this week, my big boy! His personality is getting bigger, too. One of the things that makes his smile most is when I kiss him — his whole face lights up and he opens his mouth in a huge grin. It melts my heart. As usual, there was no shortage of adorable photos this week. But my favorite would have to be the one we took for a photo contest at People.com in honor of the royal baby. My little Prince Parker! Those faces are too much! Zach and I may be biased, but we both think that he gets cuter by the day I’ve taken so many photos that my computer memory is almost completely full (which won’t stop me from continuing to take at least 10 per day!). As I type this blog post, I’m alternating between drinking coffee and a green smoothie and hoping the baby stays asleep long enough to switch laundry from the washer to the dryer…because that’s my new normal. “What can I do in this small window of time where I have two free hands and mobility without a baby in my arms or in a carrier?” This is the question I ask myself multiple times a day, either when the baby is sleeping or when my mom or husband is here. Usually, some type of house-related chore or a shower wins out, though on occasion I have a chance to sit down at the computer and type with both hands (a rare treat). Slowly but surely, I am getting non-baby-related things done. A blog post here, emails answered there, and the occasional planning sessions in preparation for my return to work in September — I’m making progress while still enjoying my cute little guy. I’ve turned my living room into a makeshift office and even done work while Parker naps in my Moby wrap, as pictured above. Oh, and I discovered that the best way to help him fall asleep is to sit down at the piano while wearing him in the Moby and sing a song; he’s usually out in less than a minute. 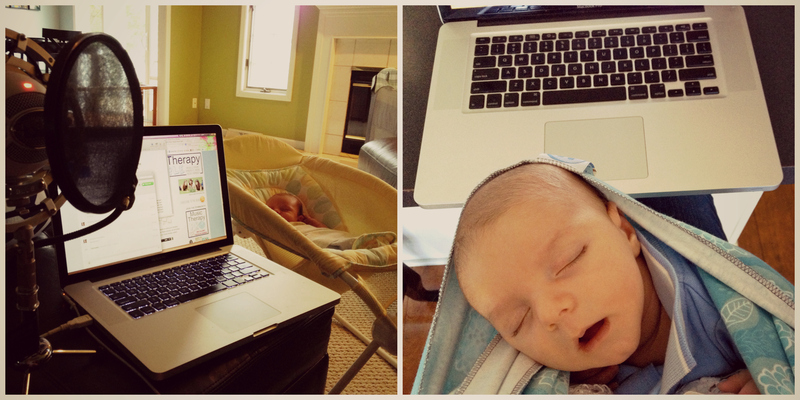 A sleeping baby and practice time: double win! I’m learning that being a mom is a juggling act, though of course my baby ALWAYS comes first. Because let’s face it, this sweet face is much more appealing than any work task I can think of. Postpartum hormones are no joke. Several friends warned me that there would be lots of crying and emotional meltdowns in the days and weeks following the baby’s arrival, and boy were they right about that. I’m lucky that the hormonal craziness went away for the most part after a couple weeks, but I still have my moments. It’s possible to become a “baby person” if you weren’t one before. I never was, but just as I’d heard, it’s totally different when the baby is your own. I am so, so in love with my son and could kiss and cuddle him all day long. I have incredible respect for parents who don’t have family living close by. Honestly, if not for our parents, I’m not sure how I would have survived the first weeks of Parker’s life. Even now, my mom comes over almost every morning so that I can get a few things done around the house and take a shower. “Letting things go” is not something I’m good at. Everyone kept telling me to forget about doing laundry, cleaning the house, making the bed, etc. but if those things weren’t done, I might have gone even more crazy than I already felt spending so much time at home. When given the choice between showering and vacuuming, the latter will always win out. Typing with one hand is a skill that I have mastered. In fact, I’m typing this blog post with my non-dominant hand, because my other arm is indisposed while I feed Parker. Typing on the computer is a little trickier than the iPhone, which is where I do most of my emailing and Facebooking these days. Speaking of Facebook, I’m totally one of those people who posts pics of their kids on a daily basis (sometimes even multiple times a day). For this, I make no apology. Candy Crush Saga is addictive if you aren’t careful. I needed something to do on my phone during all those late-night feedings, so I thought this game would be fun and harmless. It’s fun all right, but I am getting a little too hooked for my own good. Not to mention that it makes me crave candy even more than I already do! Now that Zach is a dad, I see him in a whole new light. Never would I have guessed that he’d be willing to change diapers every night at 2 am, nor did I imagine he’d become a champion swaddler (it still counts if the blankets have velcro). I’m lucky to have such a wonderful husband and partner in parenthood. I miss working. I really thought that once Parker was born, I would completely dread having to spend hours apart from him when it came time to return to work. Don’t get me wrong: I’m loving my maternity leave, but I’m looking forward to seeing my kiddos, playing my instruments (I haven’t touched the guitar in 6 weeks…hope I remember how to play), and feeling productive. The fact that I’ll have the best of both worlds — spending the day with Parker and then working (at my home studio) in the afternoons/evenings — will definitely make for an easier transition. Being a parent really is the most amazing thing ever. 9 months of pregnancy, childbirth, sleepless nights, and dirty diapers are nothing compared to the joy of holding my baby and knowing that I get to watch him grow up. Cheesy, yes; but completely true. I’m currently on maternity leave, and many of my colleagues have been kind enough to share their expertise through guest posts throughout the summer. The following comes to you from Kat Fulton, MM, MT-BC, NICU MT. It was just exactly a year ago that I alone was pushing 20-25 clinical hours per week, which means 50 hours of work including documentation and driving, plus blogging, plus preparations for the July launch of this massive online CMTE library. It was absolutely impossible to travel, because that would mean canceling sessions. Or even worse – rescheduling! Have you ever noticed that when you’re a one-woman (or man) show, scheduling/rescheduling/finding-subs is insane? I asked for help, and I got it! We’re now a team of 3 music therapists. My schedule this week follows: I ran 3 MT drumming sessions, volunteered at a kids camp (Camp Kesem – with kids affected by cancer), took some continuing education, completed some planning for the company, took on 2 consulting clients via phone, and met with my amazing team members. I planned ahead for some traveling. The most rewarding professional changes in these last 12 months have been collaborating with others through hiring. I’ve worked with sub-contractors for many years, but when it came to employees, I had no clue how to get started. Here’s how it happened: A good friend packed her bags and left San Diego in October 2012. The hospital program she built from zero to 35 hours per week in 10 months was also left behind. I offered to step in and help continue to build the program as an employee in December 2012. I ended up assisting the hospital in the interim. Both the hospital and my clients were in full disclosure of my respective work. And my private clients needed to be served. So I hired someone full-time to take over my private clients. After two weeks of training and orientation, she was all set, and I could help build the hospital program. Notice how smart the hospital was when their all-star music therapist left . . . The hospital decided to hire not ONE, but TWO therapists to take on the work. How clever is that? They hired one for most of the hours, then a second MT for overflow hours. In this case it was perfect: I took the lead with more experience, and the second MT, who was new to the field, could get supervision along the way. When April came around, I decided to pass the baton to the second MT, for her to take off running with the program. I shifted 150% of my focus back to my business. We were able to solidify some programs at the hospital, and all this shifting in the past few months has been motivating for all three aspects: in my own professional growth, for the hospital’s MT program, AND for my business. But here’s my honest opinion— Looking back, I could have and *should* have hired an employee long ago. I could have easily combined my sub-contractors’ work with a few of my own hours and hired. It would’ve made my life easier AND helped us grow faster, building our base of clients. What was holding me back? Fear of not making payroll. Fear that my clients wouldn’t pay us. Fear that the new MT will do something to tarnish my reputation. Making decisions based on fear stunts your growth. At one point earlier this year, I was juggling 3 jobs at the same time! I felt like I had multiple personalities. I know intellectually that if you try serving *everyone* then you end up serving no one. But it is difficult to take that first step, or LEAP rather. I am thankful for all this experience because here’s the silver lining: Having the hospital work gave me the confidence to hire an employee. Members of Listen & Learn Plus! can read on to learn Kat’s 5 essentials for hiring the best music therapist for your team. Kat Fulton, MM, MT-BC, NICU MT, is the founder of Sound Health Music and curator of Music Therapy Ed, a site dedicated to online continuing education for music therapists. Kat is a speaker and board-certified music therapist whose passion is achieving therapeutic goals through making music. Simply put, her motto is Be well, feel good, and make MUSIC. With a Masters in Music Therapy from The Florida State University (headquarters for the National Institute for Infant and Child Medical Music Therapy), she holds high standards for scientific research and maintains a practice infused with the latest evidence-based techniques and strategies. Kat is pleased to be associated with Remo® as an endorsed facilitator. She maintains professional membership in the American Music Therapy Association, Early Childhood Music and Movement Association, and the Drum Circle Facilitators Guild.